Although there are plenty of routes into the massif from the eastern side, there are few that lend themselves to circular walks, and hence they tend to be rather unsatisfactory. This is one of the few walks in this guide that does ascend the eastern flanks, and also allows an aesthetically satisfying circuit to be made (map). It is not, however, a walk for the faint hearted, requiring a descent of the Cheminée du Paradis, as well as a relatively challenging walk round the nose of Dent de Crolles on a traditional, but little-used path, both of which merit a Difficulty 3 classification. But despite its difficulties, it is rewarding and worthwhile. The walk starts from the car park (not marked on the IGN map) at the skiing station les Eyrauds (970 m grid ref. UTM 31T 72620 50220), off the D30. Follow the track that runs just above the cemetery for a few minutes to a tarmac road, and turn left up the hill. This soon turns into a steep forest track, which improves after a few minutes. A new hard-core road has appeared on these slopes which is not marked on the map, and we encounter it for the first time at a confusing five-way junction some 25 minutes after leaving the car. Follow the way-marked path which is the third from the left. Over the next 20 minutes, we have to cross this new road two or three more times, until we reach the Source du Sanglier (1282 m), a covered reservoir with the Pas de Rocheplane signposted straight ahead. We are now on our way. The rest of the route up to the crest is superb. It starts off steeply, but soon slackens off. Some 15 minutes after leaving the reservoir the path passes to the left of a big outcrop of yellow limestone - le Truc. Shortly after it emerges from the forest, and starts on an exhilarating section of path which rapidly surmounts the rocky ramparts to reach the Pas de Rocheplane some 2 hours or so from leaving the car. The path is obvious throughout this section, but towards the top it does require a little mild scrambling (Difficulty 2). It is always good to reach the crest, and in this case the views suddenly open up all round, with the full extent of the Dent de Crolles massif in view, and the Perquelin valley and the Grand Som beyond. Immediately on the right is a large pinnacle. From the top, two paths head off towards the south - one along the crest and the other just below. The latter is easier walking, and wanders exquisitely through a wonderful meld of rocks and flowers. The start of the Cheminée du Paradis section is heralded by a line of trees. There are a couple of ways of getting to the chimney, but the easiest way is to follow the waymarkings down a rocky barrier, and then bypass the large drop in front by immediately regaining the height by climbing up to the left. The path then descends an easy gully to the right, to the head of the chimney. The Cheminée is an impressive cleft, about 10 metres high, ten metres deep, and less than a metre wide, which is descended in three steps. There is no significant sense of exposure, but the holds are a very polished, and a little awkward (Difficulty 3). A safety line may be useful for people who lack confidence in such places, and is definitely useful for lowering packs down. At the bottom, take the path that starts by trending down and follow it to the summit of Dent de Crolles (2062 m), reached about hour and half after leaving the Pas de Rocheplane. On a clear day, the views from the summit are spectacular. The Belledonne hills can be seen over the haze-filled Isère valley to the east, and 100 kilometres to the north-east, the white mass of Mont Blanc seems to be hovering in the sky. To the north, west, and south, the Chartreuse massif fills the near and far horizons. Our descent is down the Pas de l'Œille which follows the fault gully descending through the cliffs some 100 metres north west of the summit, and has a prominent pinnacle near the top. It is quite straight forward, apart from being steep, but it is a little loose in its upper reaches. Its descent does include a couple of steep rocky sections, but these are quite easy, and furnished with cables. ¹ At the bottom of the gully, the path starts to traverse to the north-west under the cliffs. If you look below when on this section, you will see a lower path running parallel, which is the one we need to find next. Follow the path from the Pas de l'Œille until it reaches an obvious scree gully. Cross this, and then immediately turn back on yourself and cross it again but dropping down a few metres towards a thin path. It was marked with an old wooden sign in July 2004, and it takes about 30 minutes from the summit to reach this point. This is the start of the Pas des Terreaux. It crosses the pasture, and then finds a thin line between the summit cliffs and the steep valley below. The route is obvious but exposed (Difficulty 3), although some of it is equipped with cables. The most impressive section is where the path rounds the nose of the cliff, where you will be traversing on shale ledges. You should listen out for stones falling from the cliffs, all along this path. They do give fair warning by whistling at you during their descent. 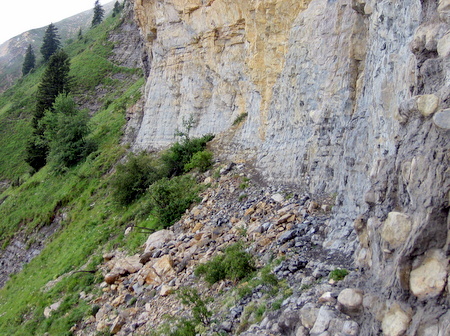 The section before the nose was subject to a massive rockfall in October 2010 which took out 150 m of path. So be warned! Once off the shale ledges, the path passes beneath the entrances to the Grotte Annette and the Grotte Chevalier. After this the path becomes a little more relaxing, although it does have one or two interesting little traverses across the top of gullies. A fence is crossed a few minutes later, and soon after the path starts to descend through some recently planted trees. The start of civilisation is marked by a Franco-Incan ruin (you'll believe me when you see it! ), and the Cabane du Berger, a small unwardened refuge from which there are good views of the summit cliffs. The path has now turned into a track, and it drops rapidly down to a junction reached after 20 minutes. Turn left, and after a few minutes it crosses a piste to become an excellent thin path traversing the hillside, with red and yellow way markings. This continues for half an hour, a little overgrown in places before disappearing under the new road encountered earlier in our walk. Turn right at this, and round the sharp bend to the left, and continue along the road for ten minutes past a junction, until you pick up the original ascent path heading down. The car park is a now just a 20 minutes stroll away, from where you will be able to pick out your ascent route. The traverse beneath the summit cliffs of the Dent de Crolles towards the Grotte Annette that you describe seems to have fallen into disuse in favour of a path 50m lower down the hillside. The lower path is a more logical route on the return and is less exposed than the upper one. It is now more worn and clearer to find but there is no security cable but does not need one and a cairn is developing at the start. The upper path is growing over and it is only the presence of the cable that gives confidence that one is on the correct path. The cable has become quite frayed at the far end belay. To return along the upper path requires keeping high on fading steps to find the correct level.